It is admittedly a pretty clever pun. The chip-based smart card which was launched with fanfare last year as Montréal's new public transport ticket is called Carte Opus. If you don't speak French, you will probably be at a bit of a loss, and if you're me, you will have initially thought of the one-hit wonder band that wrote my all-time favorite song. 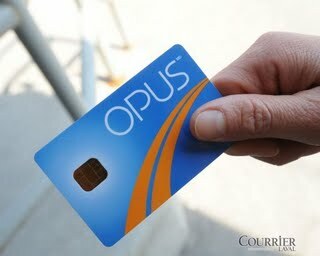 In the essence, the Opus card is an RFID-enabled device onto which you load tickets for all means of public transport in Montreal, and then just "tap" your wallet holding an Opus card on the fare gate or bus door to be admitted. In a surprising effort of collaboration, the technology was also adopted by the transit authorities of the fiefs surrounding the city (of course, neither the schedules nor the fare structures are synchronized though). It all works pretty smoothly, and by now the STM seems sufficiently confident (having run an in-your-face education campaign late last year) that they actually start sending out inspectors checking your Opus card as you ride. Today, I was stopped by two agents in police look-alike uniforms, but armed not with Taser guns, but an equally stunning PDA which can read Opus cards. It took me a moment to dig out my Opus from amidst the countless loyalty cards I carry around, but I was ultimately able to prove my status as a legal rider. Of course, obtaining the right titre de transport is far from easy: For reasons definitely not related to technology, the STM will only sell monthly or weekly, but not annual passes. What's even worse, those passes are tied to the actual calendar month, and not just any 7 or 30 day period as is the case in most other cities. And despite the fact that an Opus card can technically store up to 5 separate tickets at the same time, the passes are not sold up until a few days before the beginning of the month. This leads to the absurd situation of long lines in front of the few ticket machines and the one booth at Metro stations at the beginning of each month. And to many frustrated potential public transport users, who have the nerve to arrive in the city mid-month. They are condemned to the use of more expensive single rides or weekly tickets until the next month begins. Given the massive effort that went into the launch of the Opus card, would it have really been so hard to get a bit of best practice first? After all, the technology is far from new these days. In fact, even I am a long-time holder of two similar, but more sophisticated versions of the smart card technology, going by the names of Oyster and Octopus. Instead of another STM monthly pass, in February I'll use the two of them.